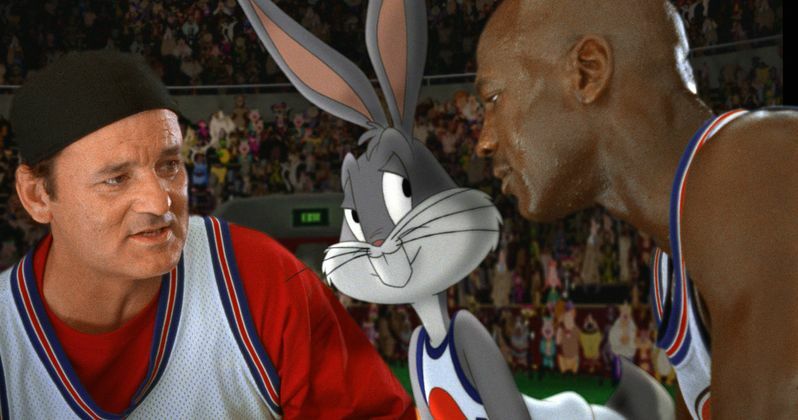 Get ready for a serious nostalgia moment, 90s kids, because Space Jam is returning to the big screen. In honor of the 20th anniversary of the release of the Michael Jordan and Bugs Bunny team-up, Fathom Events is bringing the movie back to theaters. If you want to see Space Jam in theaters again, you'll have a limited window to do so, because this is a two-night-only event. Fathom Events will be bringing Space Jam to more than 450 theaters around the country for multiple showings on November 13 and November 16. Fathom has had success with similar showings in the past, like when they re-released Brad Bird's animated classic The Iron Giant last year. Here is what Fathom Events vice president of studio relations Tom Lucas had to say about the event. "Space Jam has been a family favorite for the last 20 years and is sure to remain so for the next 20 and beyond. This event is the perfect chance for audiences of all ages to view the film as it was meant to be seen-on the big screen." Space Jam was a major event when it was released in 1996, as Michael Jordan was one of the biggest stars on the planet at the time, even though he had little acting experience outside of commercials. Plus, it served as a bit of a revamp for the Looney Tunes. The movie was a reasonable success at the box office, bringing in $230 million worldwide, but it has remained something of a cult classic for those who grew up with the movie. Outside of other NBA stars, the movie also featured Bill Murray, Wayne Knight and the voice of Danny DeVito. The movie centers around Swackhammer, an evil alien theme park owner, who needs a new attraction at his park, Moron Mountain. He hatches a plan to enslave the Looney Tunes as his new entertainment. When his gang heads to Earth to kidnap Bugs Bunny and the rest of the Looney Tunes, Bugs challenges them to a basketball game to settle the matter, which the aliens agree to. However, they decide to cheat and steal the powers of then-famous NBA basketball players to become the Monstars. So, Bugs talks Michael Jordan helping the Looney Tunes, who become the Tune Squad. Tickets for the limited re-release of Space Jam are on sale now through the Fathom Events website. As an added bonus, the Looney Tunes short "I Tawt I Taw a Puddy Tat," will be shown before the movie. In the meantime, you can still visit the original Space Jam website from 1996, which is still online for some reason. Space Jam 2 is currently in the works with LeBron James, and should be in theaters before the end of the decade. This upcoming revival should get new audiences pumped for the sequel.